The hot, dry climate of Texas makes growing cherry trees very difficult over most of the state. Cherry trees need cool winter months in order to bloom in spring and produce a crop. Sweet cherries are particularly unsuited to this southern region and are virtually unknown in Texas. However certain varieties of sour cherry such as Montmorency and Nanking are adapted to warmer climates and do fairly well in the Texas Panhandle. This area lies roughly north of an east-west line between Lubbock and Wichita Falls. Buy a healthy 1-year-old tree from a local nursery or garden center. Early spring or late fall is the best time to plant cherry trees in Texas. 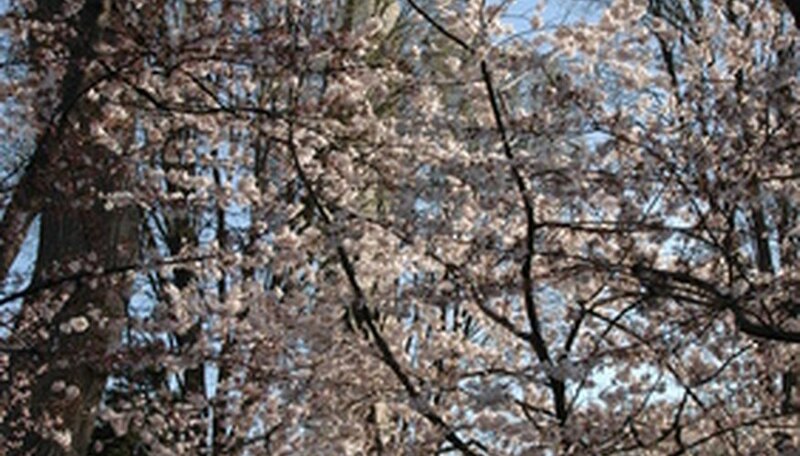 Select a well-exposed location in your yard as cherry trees need plenty of sunlight. If possible choose a well-drained location. Test the pH level of your soil by purchasing a kit or arranging a soil test through your local Texas A&M University county extension office. The soil over most of the Texas Panhandle is alkaline, being predominantly sand or clay. Cherry trees prefer a slightly acidic soil with an ideal pH level between 6.2 and 6.8. Lime can be added to reduce the pH level. Your county extension office will be able to provide information on the correct amount of lime to use. Dig a hole that is two to three times the width of the root ball of your tree. Loosening the soil for several more feet around the planting hole will make it easier for the roots to spread and establish a good base for the tree. The hole should be just deep enough so the base of the trunk is an inch above the surface after planting. Backfill half of the soil and add an inch of water around the root ball. Let this settle and finish backfilling. Soak with another inch of water and spread 4 to 6 inches of mulch around the tree. Wood chips, shredded bark or straw all make good mulching materials. Keep the mulch about 6 inches away from the trunk so that it won’t rot the wood as it decomposes. Prune the cherry tree to a single stem to encourage root growth. Give the tree at least an inch of water each week and add an inch of fresh mulch every four to six weeks to provide food and keep weeds down. Fertilizer should not be need for the first two years if well mulched. Once the tree begins bearing fruit apply one ounce of tree fertilizer per square yard in the fall. A complete blend with a 12-16-12 (12 percent nitrogen, 16 percent phosphorus and 12 percent potassium) formula works well and organic products are available at many garden centers. If you have clay soil, do not add sand or organics such as compost when planting. Doing so may keep the roots from spreading normally as they will turn in to find the more nutrient-rich soil around the root ball. The best way to amend a clay soil is by regularly applying good mulch. The mulch will break down and the change the clay to loam over time. To locate underground utility services, call Texas One-Call at 1-800-245-4545 at least two business days before you dig. This notification is required by law in Texas.